This is the local arrangements page for CCC 2004, to be held 21-24 June on the campus of the University of Massachusetts Amherst. The local arrangements chairs are David Mix Barrington and Neil Immerman of the UMass Amherst Computer Science Department. Thu 24 June: Talks ending at 11:45 a.m.
On-line registration is now available through through UMass Conference Services. The late fee is now in effect. Shelley Gibbons of Conference Services is the point person for registration questions. Once you arrive at UMass, you may register in person at the reception (Sunday 7:00-9:00 p.m.), at the Monday morning session (7:30-9:30 a.m.), or any weekday 8:30-5:30 at the Conference Services office on the ninth floor of the Campus Center. This conference is sponsored by the the IEEE Computer Society through its Technical Committee on Mathematical Foundations of Computing. The committee consisted of Eric Allender, Richard Beigel, Al Borodin, Shafi Goldwasser, Russell Impagliazzo (Chair), Subhash Khot, Steven Rudich, Chris Umans and Avi Wigderson. This was the call for papers. Submissions were electronic, handled by this server. General information about the scope of the conference can be found here on the conference home page. Lance Fortnow, the current chair of the organizing committee for the conference, maintains a weblog about computational complexity that also has a number of useful links about the field. The Lincoln Campus Center (C3/C4) containing the hotel (lobby on third floor), the sites of the opening reception, business meeting, and lunches (10th floor), and the Conference Services office (9th floor). Knowlton Dormitory (C3), site of the budget housing for the conference. On Tuesday afternoon we will have an excursion to Mt. Holyoke State Park, about six miles south of UMass. We will provide bus transportation (to the Notch Visitors center, marked by a star on the map), water, and a copy of this trail map with a long and a short suggested hike. The long one goes to the summit of Mt. Norwottuck, with excellent views of the Pioneer Valley, and to the Horse Caves, a hideout for local farmer Daniel Shays in his unsuccessful rebellion against the Commonwealth of Massachusetts in 1787. Amherst is in western Masachusetts, about eighty miles west of Boston. From within North America the best choice is usually Bradley Airport in northern Connecticut, serving Hartford and Springfield and about an hour's drive from Amherst. Travelers from Europe will probably find it much easier to fly to Logan Airport in Boston, about two hour's drive from Amherst. The most convenient way from either airport to Amherst is probably to rent a car from any of the major services. The events are all within walking distance of each other and of the restaurants in the center of Amherst, but there are places in Amherst and the surrounding Pioneer Valley that one might well want to drive to. In general parking on the UMass campus is tightly restricted during business hours (Monday-Friday 7:00 a.m. to 5:00 p.m.) and free otherwise (except for specially posted spots reserved for campus vehicles, handicapped-plate holders, and so forth). For example, you may park in Lot 63 (D3 on the map) for the Sunday reception as long as you are gone by Monday morning. The Campus Center Garage is conveniently located to the hotel and other venues, and costs $5/day during the summer. Unrestricted parking is available in lots 25 and 26 with a "Goldenrod Pass", available free at on-site registration, from the Campus Center hotel lobby, or from the Conference Services office on the ninth floor of the Campus Center. Parking in downtown Amherst is generally metered at 30 cents/hour, and free after 6:00 p.m. and on Sundays. There is a town lot/garage in the center that costs 40 cents/hour, 8:00 a.m. to 8:00 p.m., seven days a week. Valley Transporter offers limousine service to Amherst from either airport. Reservations are required. Fare from Bradley is about $40. For Boston their fare is $160 for 1-3 passengers or $205 for 4-10 passengers. If you would like to coordinate with other conferees email Dave who will try to facilitate this. Update 17 June: I have heard so far from one person wanting to coordinate transport from Logan. If you are renting a car at Logan and could offer someone a ride to Amherst, please email Dave as well. Peter Pan Bus Lines offer fairly frequent service from their Boston terminal to the UMass campus. The Boston rapid transit system can get you to the bus terminal at South Station from Logan (a free Logan shuttle connects the terminals to the MBTA). Railroad fanatics may be interested in the once-a-day passenger service to Amherst provided by Amtrak, or in the somewhat more regular service to Springfield, Mass., a 45-minute drive away. Valley Transporter also offers rides to Amherst from the Springfield Amtrak station for $36. Rooms will be available at the Campus Center Hotel on the UMass campus, only a few minutes walk from the lecture hall. Alternate housing will be available in Knowlton dormitories for the budget-conscious, and in nearby commercial lodgings. The Sunday night reception (20 June) and the business meeting (22 June) will be on campus, on the tenth floor of the Campus Center. Lunches will also be on the tenth floor of the Campus Center. The banquet will be at the Lord Jeffery Inn in downtown Amherst, a little more than a mile from the Campus Center. There are many fine restaurants available in Amherst and nearby Northampton for dinners. If you are here before the conference, the Taste of Amherst festival on the town common (intersection of routes 9 and 116-south) offers samplings from Amherst restaurants. The festival is 4:00-9:30 Thursday 17 June, 11:00-10:00 Friday and Saturday, and noon-5:00 Sunday. I have compiled an annotated list of some restaurants in Amherst and vicinity. 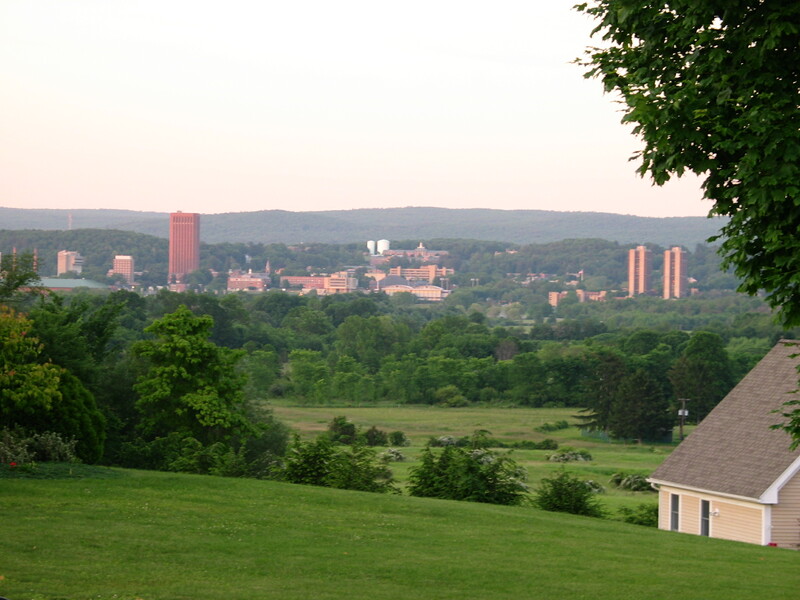 Here are some amateur photos of UMass and Amherst, including sites specific to the conference. This page may take a while to load. This site has a "virtual walking tour" of downtown Amherst, with photos of buildings of historical and architectural interest.